Home » Weather » Will 2014 have a White Christmas? Will 2014 have a White Christmas? Around this time of the year, newspapers are awash with weather related stories, after all, weather sells copies. The prospects of a White Christmas is always discussed in these reports, but how likely are we to have one this year? 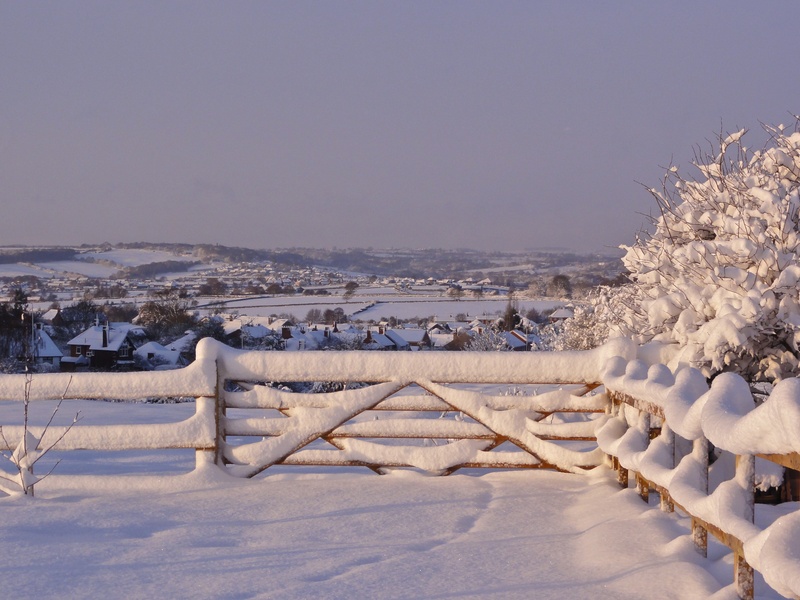 A snow covered Selston, looking over the Erewash Valley, taken on January 12th 2010. Firstly, we need to decide what the definition of a White Christmas actually is. To most people, it means that snow is falling on to a ground already covered with snow. Robins will be hopping from post to post looking for scraps of food on the surface, while squirrels scratch in the snow looking for previously buried food. Unfortunately for snow-lovers, these Christmases are very rare in our part of the World. For betting purposes, a White Christmas means a single snowflake falling on a selected location in the 24 hours from midnight to midnight on Christmas Day. Obviously, this event is far more likely, in fact more than half of Christmases in the last 50 years have been ‘white’ according to this measure. Compare this to the traditional view of a White Christmas which has occurred only four times in the last 50 years, the last being in 2010. Infographic showing snow at Christmas in the UK over the last 50 years. In 2010, an unprecedented 83% of UK weather stations reported lying snow, as well as 19% reporting falling snow. A year earlier, 57% reported lying snow, while 13% reported falling snow. So, with White Christmases occurring twice in the last five years, the law of averages dictates that this year, a White Christmas is less likely. But the weather is a fickle beast and we may see snow feet deep this year, especially if you believe the so-called weather experts who newspapers like the Daily Express love to quote. As previously stated, weather stories sell newspapers, supposedly boosting sales by up to 20%, but should we take these stories with a pinch of salt? Yes, of course we should. Newspapers quote these amateur weather forecasters to create a story to sell copies, and the so-called experts submit wildly exaggerated and often inaccurate pieces to the press, knowing that an accurate forecast won’t get a mention. So, don’t believe all you read in the media, they have papers to sell and advertisers to satisfy. Back to reality. Snow is more likely to fall in January (7.6 days) and February (6.8 days) compared to December with only an average of five days. Even March, with an average six days is more likely to see snow. White Christmases were more frequent in previous centuries, but climate change has brought about a general warming of the globe making White Christmases at our latitude less likely. This is not to say that 2014 won’t have a White Christmas – it’s far to early to say as this article was being written, but if you’re a snow-lover, I hope Santa brings you what you wish for. Weather review – November 2014 The Sun goes into reverse – it’s the Winter Solstice.